A brand new boutique brings designer menswear to the heart of Barnt Green, writes Sally Oldaker. Gone are the days when clothes shopping was solely the preserve of the female of the species – modern men take a pride in their appearance and many spend time seeking out top quality brands. Fortunately for the discerning menfolk of Barnt Green and its environs, a new boutique has brought those sought-after labels to the doorstep, meaning there’s no need to travel into Birmingham or Solihull to find the latest developments in menswear. Capella Designer Menswear, recently opened in Hewell Road, caters for a range of ages and tastes, from trend-setting youngsters to smart and stylish gentlemen. Classic suits by the likes of Armani and Hugo Boss sit alongside streetwise contemporary designs from new young labels Smet and Shirio Neko. There’s also a selection of retro-style 80s wear, such as FILA clothing and bright white trainers – and Capella stocks plenty of accessories like belts, bags, caps and scarves, perfect for the fashion-conscious man in your life. The wide variety of suits, shoes, shirts and ties available in store means that busy men can put together an entire outfit in just one visit, in the knowledge that every garment is of the highest quality and will stand the test of time. With Christmas in mind, Capella offers some great gift ideas, including Armani boxer shorts and socks, aftershaves and of course the vast range of other accessories. Capella is a brand new venture for owner Paul Mitchell, who has brought in an experienced manager, Julian Walton, to look after the day-to-day running of the shop. Julian (pictured above), who previously worked in a designer clothing outlet, is knowledgeable about the designer brands and can advise customers on how to choose the perfect item or outfit. 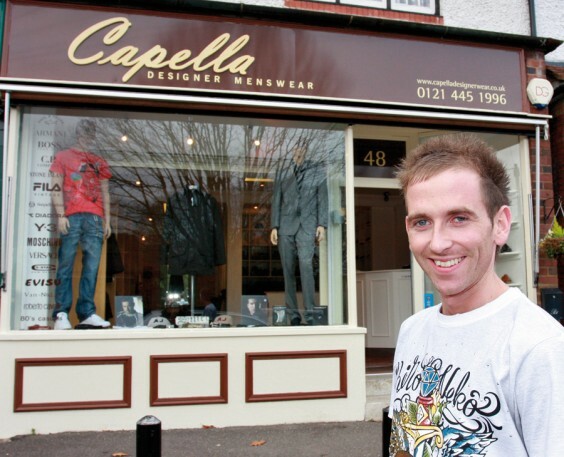 Since its official opening on November 8 (when former Birmingham City and West Bromwich Albion footballer Geoff Horsfield was guest of honour), Capella has already attracted some regular customers, who no doubt appreciate the combination of friendly service and top quality clothing.